1. Make sure the floor is thoroughly free of all traces of dirt, dust or grease. Use low-tack masking tape to protect the skirting boards and door frames from paint splashes. 2. Apply two coats of pale floor paint using a roller or a synthetic brush, allowing at least 4 hours between coats for the paint to dry. 3. 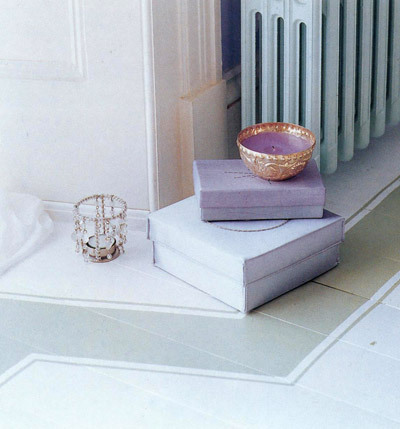 When the paint has dried completely, draw the border straight on to the floor using a soft pencil and a ruler. Mask off the outline, including the outer lines, with low-tack masking tape. 4. Fill in the border in the darker paint, taking care not to paint beyond the masking tape. Before the paint dries, peel off the tape. Allow the floor to dry completely. What you need: Low-tack masking tape, pale floor paint, roller or synthetic paint brush, soft pencil, long ruler, dark floor paint.